A renovation and some serious decorating revive an old yellow-brick home in the heart of London. 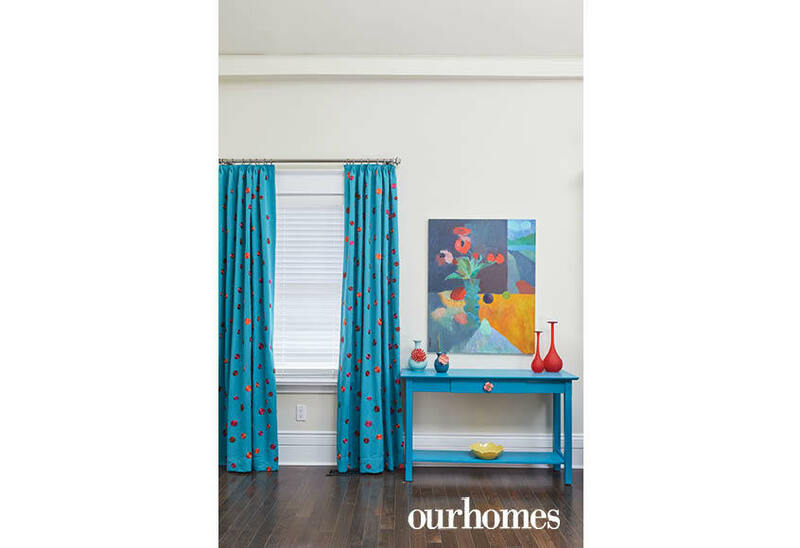 A version of this article originally appeared in the Fall 2018 issue of OUR HOMES London and Middlesex County, p.36. Find local businesses in our London directory. 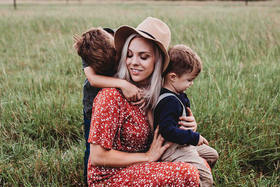 Purchasing a more than 120-year-old home was not in Rebeca McIntosh's plan. She was looking for a home with a great kitchen and a pool. But rather than finding these features ready and waiting, they became part of an extensive renovation to a century home in London’s core. The yellow brick storey-and-a-half house offered high ceilings, beautiful stained-glass transoms and other character elements. It also came with a very large propert that could accommodate a swimming pool. Rebecca asked designer Nancy Evans of Inside Inc. and contractor Paul Hales of Paul Hales Painting & Decorating Ltd. and Quality Pro Renovations to help her establish a vision. They would have to remove walls and widen and raise doorways to establish the right scale, an airier atmosphere and better sightlines. Old wood and linoleum floors were replaced with dark-stained engineered wood. A new HVAC system and tankless hot water heater went in. 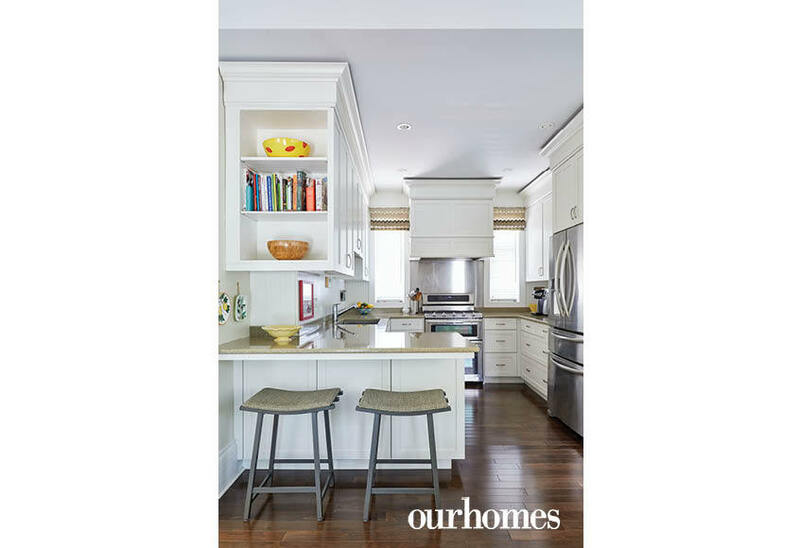 The kitchen was transformed into a cheerful workspace with white custom cabinetry by Wm. 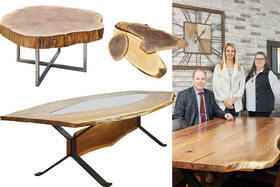 E. Tyssen Furniture & Millwork Ltd. in a compact u-shape. Two windows nicely frame a dramatic range hood (appliances from London Major Appliances). 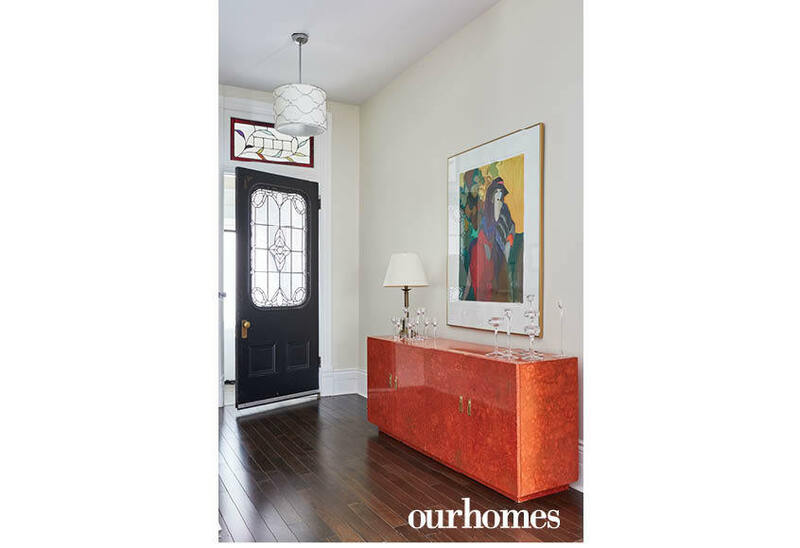 The front vestibule, with original stained-glass door by London artist Ted Goodden, now opens to a spacious entry hall then an airy middle space connecting the front of the house to the kitchen area and family room beyond that. 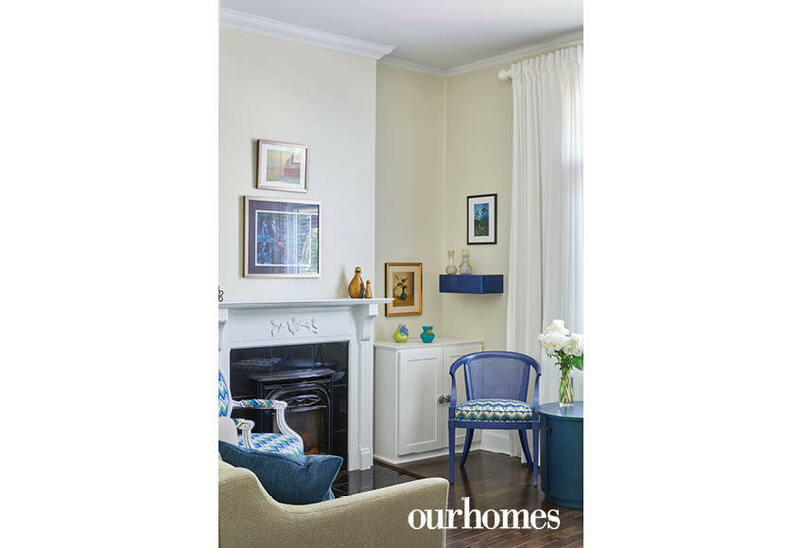 In the kitchen, an off-centre banquette along the wall of the eating area with table and chairs (The Table & Chair Co. Inc.) allows easy access to the family room. Orange and tan define the large central space, the kitchen is mainly neutrals with teal and orange accents and the family room features pops of teal, copper and violet. Nancy chose drapery fabrics to add colour and geometric, circle, flame stitch and dot patterns. 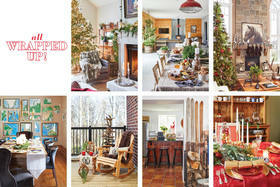 She made choices that minimize visual clutter and don’t compete with the paintings they sit beside, she says. 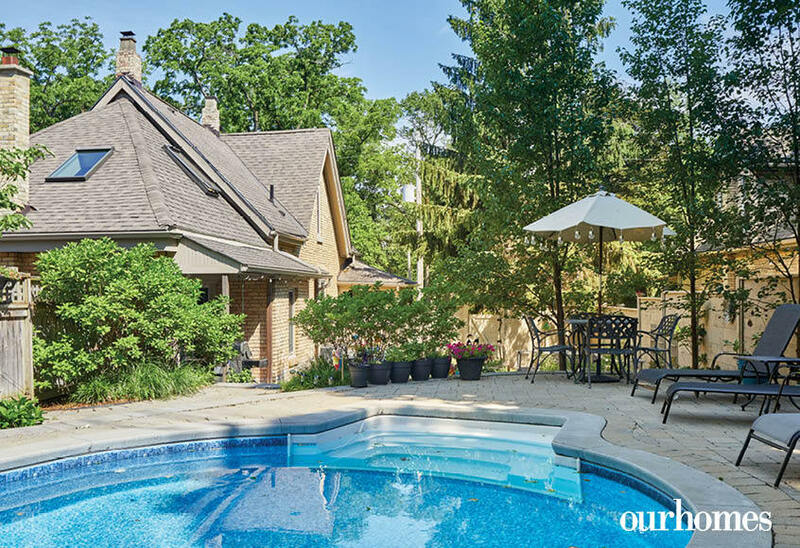 Outside, Rebecca hired Forest City Pool & Patio to install her coveted swimming pool. 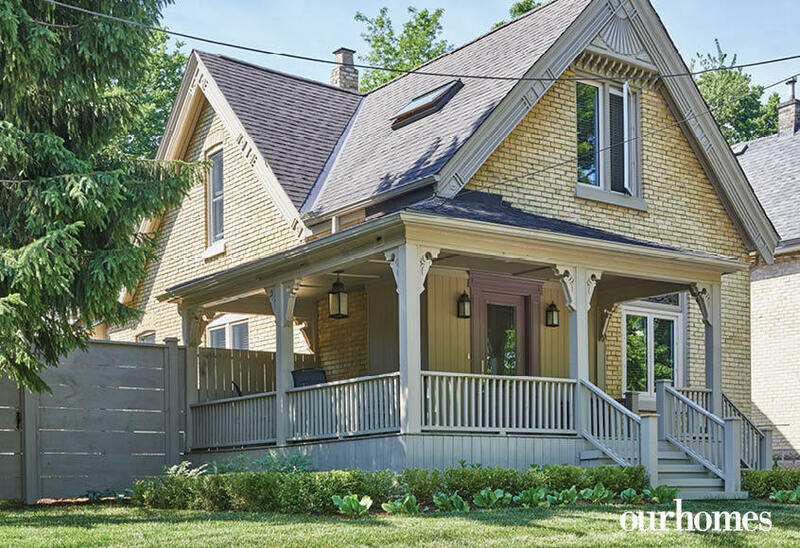 A restored front porch, stylish fencing and new landscaping make a stately welcome to the core-area century home. Trim colours were custom mixed. 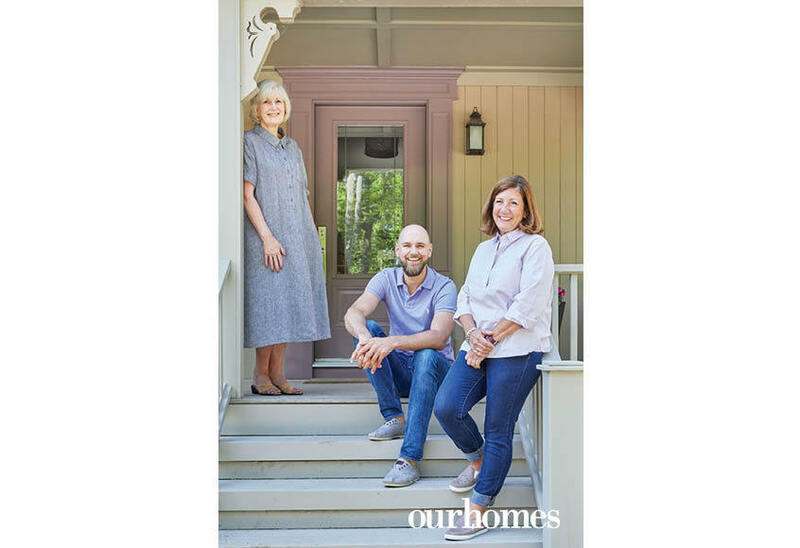 Homeowner Rebecca McIntosh, right, with two of her design team, Nancy Evans of Inside Inc. and Grant Gilvesy of Grant Gilvesy Design. The chic colour choice for the front door is Quietly Violet by Benjamin Moore. 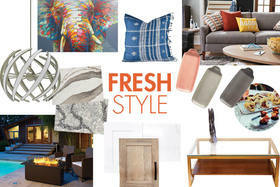 The spacious entryway announces Rebecca McIntosh’s unique taste and love of colour. 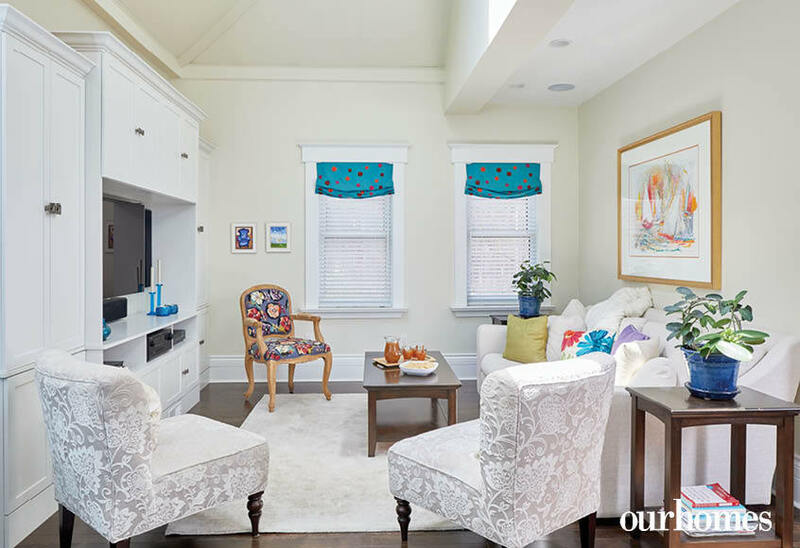 The owner enhanced the existing family room with a large built-in entertainment centre, cosy furniture and cheerful pops of colour. Walls throughout the house are Benjamin Moore Battenberg. Trim is Cloud White. Many colour choices throughout were inspired by whimsical pieces of art. Drapes were chosen for smaller windows to make them appear bigger. Roman blinds inside the frames of others add visual balance. The small front parlour is a kind of homage to Rebecca’s parents. She inherited many of their lacquered and speckle-painted pieces, including chairs she had reupholstered in blues and greens. 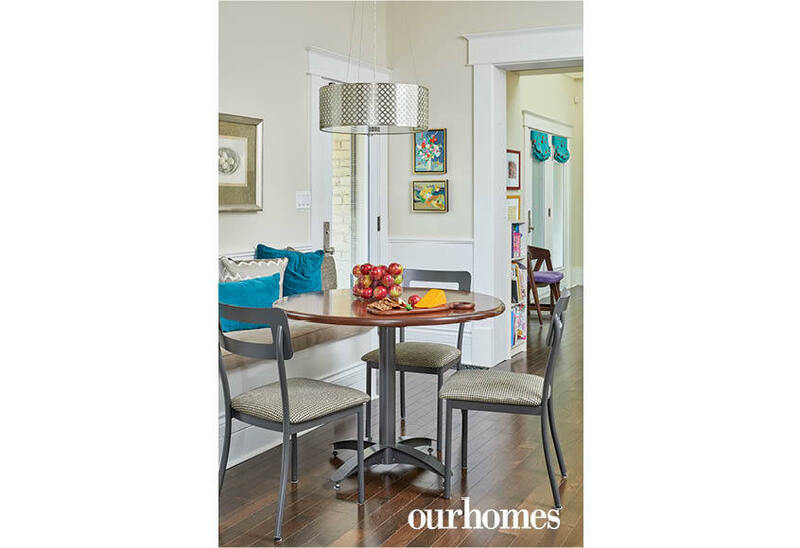 Clean, contemporary lines in furniture and lighting (fixture from Guildwood Lighting & Fireside where other lighting was sourced for the home) define the dining room. Three marble columns topped with candles (Bernardo Group Ltd.) add dash. The compact work area, including a handy peninsula counter in quartz composite, provides a functional workspace for the serious home chef. 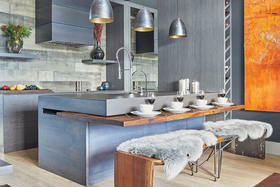 When she first saw the house, the owner knew immediately these windows would nicely frame a dramatic range hood. The kitchen eating area was located along the side wall, creating easy access from the front of the house to the back. 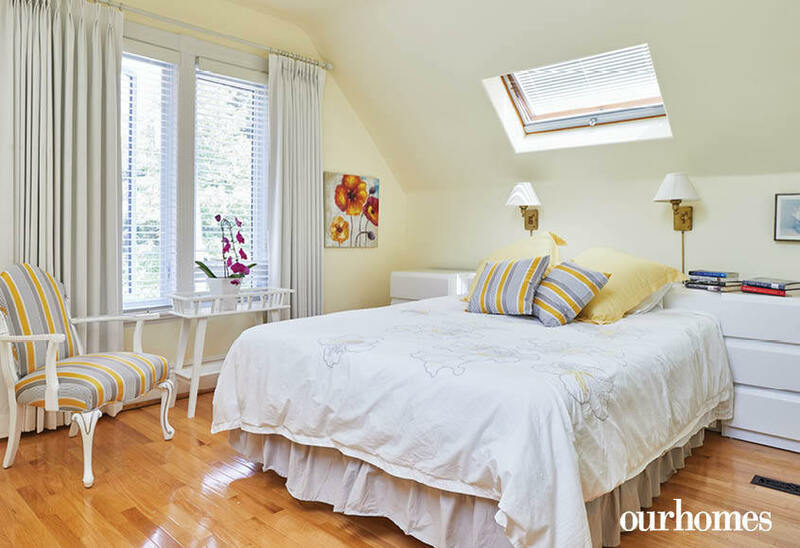 Soft yellow with grey and white accents make the master bedroom a welcome retreat. 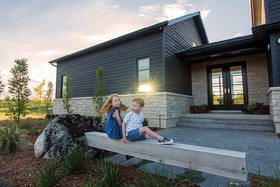 An added feature of the home is its outdoor living space, unusually large for the centre of town. 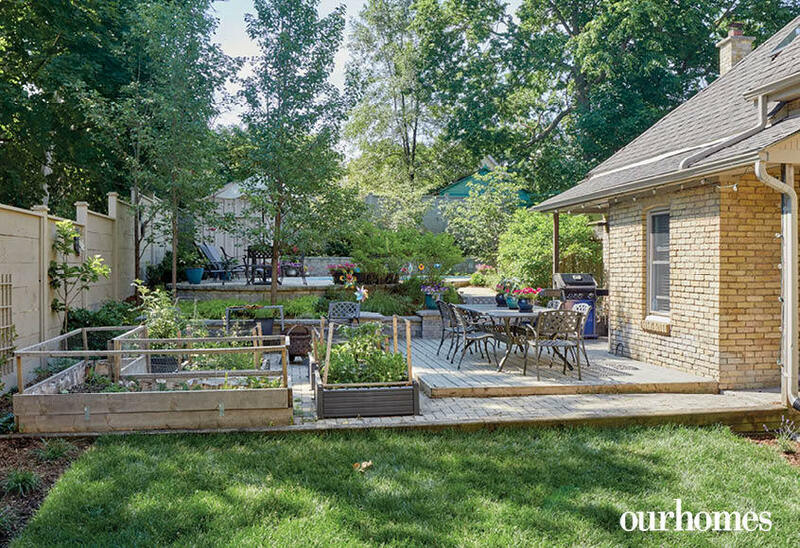 Fresh vegetables and herbs are at the ready thanks to garden boxes just off the kitchen. Rebecca and her family enjoy their pool well into the fall season.